"See that green on his face? See how he uses his finger there?" Mark A. Roglán, the director of the Meadows Museum at Southern Methodist University here, is bubbling with enthusiasm for his latest acquisition. It's a tender portrait of a youth painted by Francisco Goya just months before the artist died. Mr. Roglán is so overjoyed that he has placed the work in the middle of the museum's central gallery, rather than against a wall, so viewers can read the affectionate dedication scrawled across the back: "Goya to his grandson in 1827 in his 81st year." 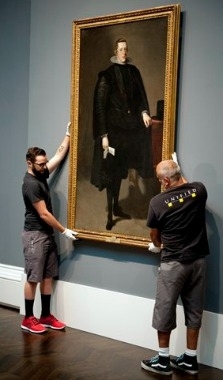 Oddly, "Portrait of Mariano Goya, the Artist's Grandson" failed to sell at Sotheby's in January 2013. Expected to fetch $6 million to $8 million, it had come from the estate of the renowned collector George Embiricos, a Greek shipping magnate who also owned the Cézanne "Card Players" that was reportedly sold privately in 2012 to the Qatari royal family for $250 million. The Goya was fresh to the market, not exhibited publicly since 1970, which should have enhanced desirability. But Mr. Roglán, 42, a bear of a man who bought the picture this fall for a price near the low end of the estimate, has a ready explanation: The informal portrait, painted quickly and in a limited palette, is too modern for Old Master collectors and too old-fashioned for collectors of mid-19th-century art—but perfect for the Meadows, which aims to be the center for Spanish art in the U.S. As the sixth Goya in the collection, this "bridge between tradition and modernity" takes the Meadows a step further toward the aspiration of its founder, Dallas oilman Algur H. Meadows (1899-1978), to create "a Prado on the prairie," that is, a smaller version of Spain's comprehensive national museum. In the 1950s, Meadows had frequently visited the Prado on his business trips to Madrid. Soon he was buying paintings—perhaps, since there was little interest in Spanish art in the U.S. at the time, sensing a bargain—and in 1961 he announced the gift of his collection to SMU, followed by money for a museum, which opened in 1965. Despite a scandalous start—Meadows had purchased many fakes and misattributed works, earning blistering national press coverage—the museum has long since weeded out the bad works and made additional purchases. It now boasts a collection of 819 items spanning the 10th to the 21st century. Among its 151 paintings are three by Diego Velázquez and five by Bartolomé Esteban Murillo, plus works by Pablo Picasso, Joan Miró and Jusepe de Ribera. "All the great Spanish artists," Mr. Roglán says, "except Dalí." (That's a slight exaggeration: When, for example, I ask about Luis Egidio Meléndez, the great 18th-century still-life painter, Mr. Roglán replies: "We need one of those, too.") The Meadows's only U.S. rival, he asserts, is the Hispanic Society of America in New York. Still walking around the central gallery, Mr. Roglán points out such great works as El Greco's "Saint Francis Kneeling in Meditation" (1605-10) and Vicente López's portrait of " Richard Worsam Meade " (1815), choosing from a massive installation of works hung salon-style, from ceiling to floor. Normally, these and others from the collection are hung throughout several galleries. But they've all been emptied out for "Sorolla and America," which presents 152 works of art. Joaquín Sorolla, though sometimes called an Impressionist, defies precise categorization. His paintings are suffused with light, but many are realistic portraits, beach scenes and history paintings. His 1909 exhibition in New York was mobbed by 150,000 people in one month. Americans of that era rushed to buy his works. But Sorolla's work has long since fallen out of favor. Perhaps one incident captures his fate: In 1927, four years after his death, the Brooklyn Museum purchased four large charcoal and pastel drawings, but they have never been on view. "We went there to find a painting, and they said how about looking at these," Mr. Roglán says. They're in the show at the Meadows. In a way, that story is also a metaphor for Spanish art. The public may appreciate Velázquez, Goya and Dalí, but not many others from Spain (Picasso, who moved to France in his early 20s, is associated with the School of Paris). 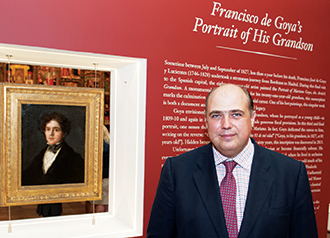 Mr. Roglán, a Madrid native who worked at the Fogg Museum at Harvard and at the Prado before moving to the Meadows in 2001 (becoming director in 2006), is every bit as eager as the museum's founder to get Spanish art its due. He hopes that reintroducing Sorolla in this retrospective, which opened last month and will travel to the San Diego Museum of Art and then to Madrid, will restore the artist's renown. The curator, Sorolla's great-granddaughter Blanca Pons-Sorolla, gathered dozens of works that have not been shown publicly in 100 years, including more than 40 that have never been exhibited. Early word is favorable, with art historian Rick Brettell, in the Dallas Morning News, calling Sorolla "a well-rounded artist whose landscapes, genre scenes and even historical paintings had a fluency and immediacy that even the impressionists could envy." Good crowds may push the museum's annual attendance above the usual 50,000. Strategically, Mr. Roglán scored a bigger hit in 2010, when he forged a three-year pact with the Prado, which promised to lend a major painting to the Meadows annually, among other things. So far, the Prado has sent El Greco's "Pentecost" (c.1600), Ribera's "Mary Magdalene" (c. 1637) and Velázquez's "Philip IV" (1623-27) for focused exhibitions. The Prado could easily have partnered with more prestigious museums, but Mr. Roglan says it was attracted by their shared mission of promoting Spanish art and the Meadows's setting at a university, which can provide access to scholars in many fields. The partnership has since been extended and expanded; the two museums are now organizing exhibitions that they both show. One featured landscapes by 19th-century painter Martín Rico, and next summer the Meadows will display about 80 Spanish works on paper from the well-known collection of the Kunsthalle in Hamburg, Germany. The exhibition will then move to the Prado. Mr. Roglán is also eager to talk up another aspect of the partnership, a curatorial fellowship that gives graduate students an opportunity to work at both institutions. "The most critical thing" about the Meadows-Prado pact, he says, "is furthering Spanish culture with research and scholarship." That way lies its future.